Don’t you dare say a word about my dirty hob-top. That’s the sign of a good cook, that is. I’ll challenge anyone who says otherwise to frying pans at dawn. Now then. Chilli. It’s a dangerous thing to give a recipe for because everyone thinks their own is the best. So read mine, and then do whatever you like with it. Add to it, take away from it, bugger about with it, I won’t mind. The only thing I ask that you include is cumin, because that’s what brings the dish together. As most people know, chili tastes better the next day So it’s perfect to make on a Sunday night and eat on the Monday. Basics first – soften the onion and pepper in whichever pan you want to use to cook your chili in. When it’s going translucent, add the garlic and cook for another minute or so. Now add the minced beef and turn the heat up. Brown the meat. It doesn’t have to completely cook through, but give it a bit of colour so it doesn’t look grey. When you’re happy, add in the cumin, coriander, tomato puree, cayenne pepper, thyme, salt and pepper. Fry for another couple of minutes so it mingles well then add the beef stock. Bring it up to simmer and taste it. This is important – you MUST taste it. If you want to add any more of anything, do so. Chili is an intensely flavoured dish so don’t be nervous. It’s hard to muck it up completely. Leave it to simmer for however long you’ve got. A couple of hours would be really good but don’t fret if you’ve only got half an hour. If it needs more liquid, add some water. If it’s too watery, turn up the heat and boil it off. 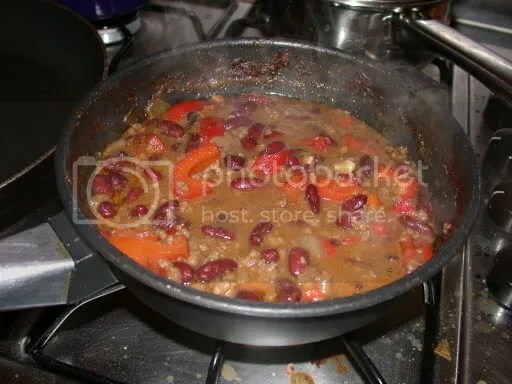 Half an hour before you want to served, add in the kidney beans. Stir well and let it be. If you want to freeze it or put it aside for the next day, this is when you do it. When you’re ready, serve with a dollop of sour cream. I find brown rice rather than white tastes better with chili, no idea why. Enjoy it! Eat more of it than you should! And I generally fry the mince first, then drain off most of the fat. But other than that, that looks pretty darn tasty. A touch of cinnamon can be nice too. looking good but where is the tomato. doesn’t sound to harty and hes right there should be some chilli powder if not tabasco- p.s i am a brit but i’m WELSH! That looks good! It should, the recipe is very similar to mine. I, too, brown the beef first, remove the fat and then begin softening the vegs. I use chili powder rather than fresh chilis; about half as much chili powder as cumin. For this recipe, I add a 28 oz can of tomatoes; and, sometimes, about a Tbs tomato paste for deeper flavor. I don’t use thyme in my chile — but I am going to try it; likewise the beef stock. – heat a small cast iron / solid pan at full whack and add some olive oil till it smokes – fry the beef in small quick batches without moving about too much chef styli so it really browns and just remove to a plate. Continue with smokin pan and topping up the oil when needed until you’ve got a plate of well browned steak tartare. Then start with your onions / chilli powder / cumin etc and add the meat as normal – my top tip is to cube up a 1 inch slice of chorizo from the deli counter and put that in with the onoins instead of oil. Try using 1/2 t-spoon of paprika and another one of cayene pepper, and I prefer a tin of chopped tomatoes and 1 T-spoon of puree, but hey everyone has a different idea as you said! Once I made a chili with a recipe from Men’s Health magazine. It called for several squares of dark chocolate. I found it strange but did as the recipe said. It turned out delicious! I added it about five minutes before the chili was done. It adds a layer of richness and definite sweetness. i want to send you a recipe for white chili made with ground turkey, tomatillos, white beans, and spices, with queso blanco and jalepenos/scallions on top (you can use feta cheese as a substitute). Pork loin stuffed with pinenuts, lemon and sage and wrapped in parma ham. This site, recipes and all content are copyright Francesca Tweedy 2008.